The cancer therapeutic implications of the Warburg effect. Whereas normal human cells use a process named mitochondrial oxidative phosphorylation (MOP) to generate energy from glucose, some unicellular organisms (eg: microbes) use a different process called anaerobic glycolysis to reproduce as quickly as possible when nutrients are available. The Nobel laureate, Otto Warburg, noticed in 1924 that cancer cells metabolize glucose in a different way to cells in normal tissues. 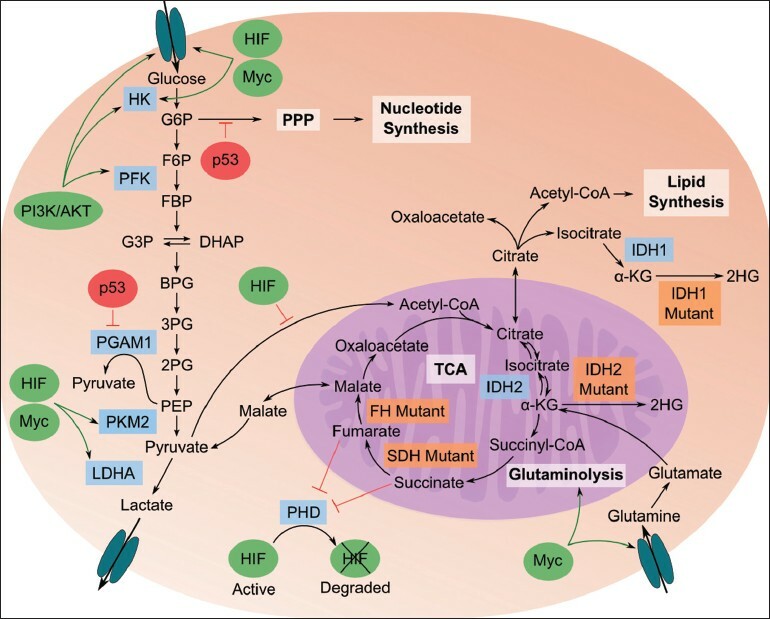 Cancer cells tend to ferment glucose into lactate (even in the presence of sufficient oxygen to support MOP) using aerobic glycolysis as their principal metabolism pathway, a process similar to the one used by microbes; today we know this type of metabolism as Warburg effect. In fact, nowadays, we know that a generalized property of primary and metastatic cancers is upregulation from glycolysis, resulting in increased glucose consumption (even 200 fold higher than a normal cell). Why do cancer cells use aerobic glycolysis to produce energy? Some researchers explain that this type of metabolism is used because the tumor environment lacks sufficient oxygen to support the uncontrolled proliferation and high-metabolism rate of malignant cells; others hypothesize that cancer cells develop a defect in mitochondria that leads to impaired aerobic respiration. However, recent investigations showed that mitochondria are not impaired in most cancer cells and that even in presence of oxygen, the Warburg’s effect takes place. A third hypothesis is that proliferating cells prefer aerobic glycolysis because this process generates critical molecules to support cell growth and division (eg: carbon and nitrogen). The metabolic dependencies of cancer-cells can be used for the development of cancer treatments that target the Warburg effect. Recently a research article, published in Cancer Cell, showed that a newly-developed drug can stop cancer-cell growth in animal models and human cancer-cells in vitro. The new drug, named SR9243, suppresses abnormal glucose consumption (Warburg effect) and cuts off energy supply driven by lipogenesis. SR9243 acts by disrupting the function of the liver-X-receptor (a master protein that regulates the expression of glycolytic and lipogenic genes). This is not the first drug developed against the Warburg’s effect, but the previous ones had poor toxicity-profile with a broad collection of side-effects. SR9243 selectively induces destruction of cancer cells and spares non-malignant tissues. It also offers a better safety profile without over-toxicity effects. All of this makes SR9243 a significant promise to be used in human clinical trials in the future. i) Gatenby RA, Gilles RJ. Why do cancers have high aerobic glycolysis? Nat Rev Cancer. 2004; 4(11):891-9.
ii) Vander-Helen MG, et al. Understanding the Warburg Effect: The Metabolic Requirements of Cell Proliferation. Science. 2009; 324(5930): 1029-1033.
iii) Flaveny CA, et al. Broad Anti-tumor Activity of a Small Molecule that Selectively Targets the Warburg Effect and Lipogenesis. Cancer Cell. 2015. Entrada anteriorUn nuevo medicamento que favorece la regeneración tisular. Entrada siguiente¿Qué es la migraña? Buenas tardes somos un matrimonio médico de Argentina, interesados en éstos temas. Sinceramente EXCELENTE sus trabajos. Muy bien, explícito y concreto. Agradecemos sus comentarios, nos impulsan a seguir produciendo material de calidad. Cualquier duda, sugerencia o comentario estaremos contentos de escucharlo.